Double Action Blaster Guys is the sequel to my contribution to the 2011 compo, Forehead Block Guy. 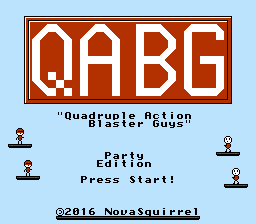 It's completely rewritten so it's nowhere near as buggy as FHBG was, and I took the opportunity to rewrite it with two simultaneous players in mind, hence pluralizing Guy in the title. One thing I find strange is gravity. When you drop in the bottom and no platform is in your way, you'll end upfalling from to to the bottom again, and again etc. Meanwhile, gravity will increase to ridiculous point and, after some more time, it will reset itself to zero. It's not a big bug or anything, but I'd fix it by limiting gravity max potential at some point. Great little game NovaYoshi! Nice work! I limited both player and enemy gravity to falling 8 pixels per frame, and reduced the "extra" menu to three items. The blank slot on it was from back when I thought I was going to go over the limit for NROM-128 and I would have unused space in the 32kb of PRG ROM to add in more stuff that would warrant another menu item, but I made it fit. I also left the select key level skipping on purpose, and FHBG had a debug key too. I figured it would be convenient for someone who just wanted to check out the levels and the title screen already lets you skip ahead to level 13 or 25 if you want. Select could be repurposed into being an "insert coin" button if I did a version that took the arcade style further and tried to make it like an actual arcade game and didn't want users to be able to skip. Select does something similar in Lode Runner. Or you could use the method that Thwaite and PyFHBG use: a "practice" option in the menu. Actually, I suggest instead to make SELECT do nothing but program it in such a way that a Game Genie code patches a single byte of the ROM to make the SELECT button to skip levels (you can include that code in the documentation). If you want to make a arcade game with insert coin, you could use the Vs.System function for that, though. If you select and play a 2P fight game and finish, all other modes are unable to start (until reset) as they are incorrectly interpreted as a 2P fight game. It also had randomly crashed in the middle of the double boss head level. When I originally wrote DABG I used constants for the player count, and I didn't have to do very much to increase it. There were a lot of unrolled loops (that didn't use .repeat) that needed fixing, and I had to put in new logic for versus modes. I don't feel like the sprite scanline limit is as much of a problem for this kind of game since the players are going to be jumping from platform to platform and going after different enemies.